The Hacker's Diet , notwithstanding its silly subtitle, is a serious book about how to lose weight and permanently maintain whatever weight you desire. 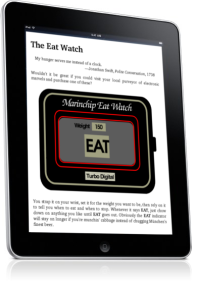 It treats dieting and weight control from an engineering and management standpoint, and provides the tools and an understanding of why they work and how to use them that permit the reader to gain control of their own weight. The book is intended primarily for busy, successful engineers, programmers, and managers who have struggled unsuccessfully in the past to lose weight and avoid re-gaining it. Computer-based tools and experiments in Microsoft Excel or the Palm Computing Platform are available, as well as an online Web application, but a computer is not necessary to use the techniques described in the book; paper and pencil alternatives are provided. The EPUB edition is in the open document format compatible with the iBooks application on the Apple iPad, iPhone, and iPod touch; Sony Reader; Barnes and Noble Nook; and a variety of other electronic book devices and mobile platforms. EPUB books may be opened directly with a Web browser using the EPUBReader add-on for Firefox or the eBook Reader widget for Opera, although users of desktop and notebook computers with Internet connectivity will probably prefer the Web edition, due to its more flexible navigation options. If your Web browser has an EPUB-compatible plug-in installed, you can open the book simply by clicking on the The Hacker's Diet EPUB Edition link. Otherwise, use your browser's idiom to download the abovementioned file to your computer and then transfer it to your reading device according to the manufacturer's directions. For the iPad and iPhone (etc. ), just drag the downloaded hackdiet.epub file to iTunes, where you should see it in the “Books” section. Then connect your reading device to the computer and the book should be transferred to it by the Sync process. If the book is not installed, make sure that you've enabled syncing books to that device, and that if you've opted not to sync all books in your library to the device, that The Hacker's Diet is checked to be copied. You must also, of course, have the Apple iBooks application installed on the device; if it's missing, go to the App Store and install it—it's free. The Hacker's Diet EPUB edition contains no “Digital Rights Management” constraints: you are free to install it on as many devices as you wish, transfer it among them (if their hardware and software so permit), and pass on copies to others. It should be compatible with any EPUB reader hardware and software which can open standards-compliant unrestricted files. Computer-based tools and experiments for Microsoft Excel and the Palm Computing Platform are available for downloading. 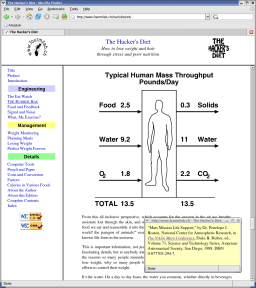 A Web-based application, The Hacker's Diet Online, which can be used from any computer with Internet access and a Web browser, is available. This Web-based application allows you to maintain weight and exercise logs, produce custom charts, analyse trends, and plan diets from any computer with Internet connectivity and a Web browser. Data may be imported from and exported to other versions of the computer tools, or exported as CSV or XML for analysis with other programs. Versions compatible with a variety of Excel releases are available, all ZIPped archives of about 250 Kb. An implementation of the Eat Watch nutrition and exercise log and analysis software for the Palm Computing Platform (PalmPilot, Palm, PalmOS, etc. ), including desktop software for any platform with a standard C language environment which generates illustrated HTML logs from databases backed up from the handheld. If you prefer to read the book off-line, you can download a PDF edition (1.3 Mb, ZIP compressed) which you can read with the Adobe Reader utility, available for most personal computers and Unix workstations, which may be downloaded free of charge directly from the Adobe Systems Web site. The PDF edition preserves all the formatting of the original book, and permits point-and-click navigation among chapters and to follow cross-references in the text. Adobe is one of the most consistently irritating companies on Earth with which to do business. I'd like to give you a nice button for downloading your own copy of Adobe Reader, but they won't let me use the image without “registering” and “licensing” it, which I'm certainly not going to do in order to promote their product and its file format. The Hacker's Diet was originally typeset using TeX with the LaTeX macro package. Camera-ready copy was generated from PostScript created by the dvips utility. The PostScript edition is a single monolithic file, almost 2.7 megabytes, containing the entire book as originally typeset. You can read it on-line with a PostScript viewing program such as GhostScript (which is free), or print it on any PostScript-compatible printer. Before sending this file to a printer, consider that the book is almost 250 pages long! This is a big print job, which will consume lots of paper, toner, and, potentially, good will of any colleagues with whom you share the printer. The PostScript edition may be downloaded as either a ZIPped archive or a gzip compressed Unix tar file; both are 702 Kb in length and uncompress to a 2.7 Mb PostScript file.